The Col-Met EZ Limited Finishing Prep Station draws fresh air from the cleaner upper levels of the shop through a pressurization fan. This air is forced down into the prep station through a filter bank located in the ceiling near the entry. The air is drawn through the prep station work area into a filtered exhaust plenum at the opposite end and exhausted out to the atmosphere through the exhaust fan and stack. This design allows for easy addition of a heated air makeup unit. 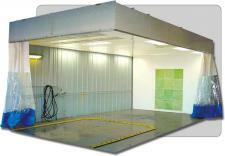 Panels, assembly hardware, filters, and sealants needed for mechanical installation are included. The threaded rod for suspending the intake plenum is not supplied by Col-Met. Goff’s™ Curtain walls, intake and exhaust stack, control panel, and other electrical components may be purchased separately. Bright full booth illumination is provided by eight (8) four-tube, 48? long, 32-watt, fluorescent light fixtures in the ceiling panels. Each is sealed behind clear tempered safety glass. All fixtures are UL listed and approved for their intended use and placement. The Hanging Intake Plenum and Exhaust Plenum Wall will be fabricated with 18-gauge galvanized steel panels; flanged for strength and pre-punched for easy nut and bolt assembly. The intake plenum may be suspended with a maximum of 10’ tall clearance or as low as 7’ tall clearance. The actual installed height is required to order the Goff’s™ Curtain walls. Intake air is supplied by one (1) 18” diameter tubeaxial fan with a 1-1/2 HP, three-phase motor. Exhaust is provided by one (1) 18” diameter tubeaxial fan with a 1-1/2 HP, three-phase motor. 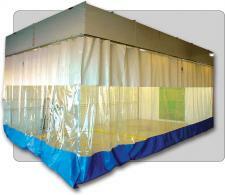 Col-Met Spray Booths’ EZ Limited Finishing Prep Station complies with NFPA 33 regulations pertaining to limited finishing workstations. Optional ETL listing is available on this product.